Infusion therapy is the use of needle or catheter for administration of medicines. This technique is used when the patient cannot be treated by oral medicines. The use of various infusion therapies is one of the reason for the growth of infusion therapy market. Different types of infusion devices include pumps, needles, docking station which can further divided into various segments. The infusion therapy market was valued at $7287.3 million in 2017 and is anticipated to grow at a CAGR of 4.29% during the forecast period 2018-23. 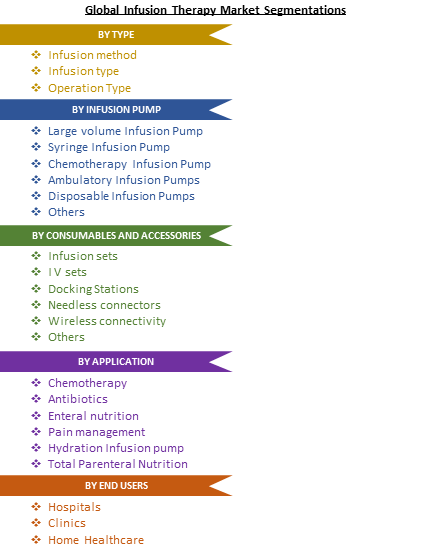 Large volume infusion pumps dominate the market with a share more than 35%. The chemotherapy infusion pumps market generated over $28.1 million in 2017 and is projected to grow at a CAGR of 9% during the forecast period. Infusion therapy has become a popular pain relieve treatment method, especially for diseases where oral medication is least effective. In this technique, the drug is usually administered intravenously or subcutaneously. Due to the advancement in various technologies, patients are switching from conventional treatments to specialized infusion therapy treatments as the results are more effective. Infusion therapy has been widely used in treatment of diabetes, gastrointestinal diseases and various kinds of cancer. Infusion therapy is also used in treatment of different types of dehydration. Infusion therapy can also be used at home which reduces frequent hospital visits. Some of the commonly used infusion devices for administration of medications include needleless connectors, infusion pump, and intravenous set. This report incorporates an in-depth assessment of Infusion therapy market by type, pumps, accessories and consumables, applications, end users and geography. What are the major applications of Infusion Therapy? Infusion therapy is widely used during pain management, chemotherapy, dehydration and nutrition supply. Infusion therapy is used in hospitals, clinics and as well as home. The use of infusion therapy in hospitals dominates the market. Intravenous infusion therapy is known to treat pains of all kinds including headache and neuropathic pain. Some infusion pumps are designed to aid a particular disease treatment. For example, enteral pump is used to deliver liquids or medications to the digestive tract. Congestive heart failure, Crohn's Disease, hemophilia, immune deficiencies, multiple sclerosis, rheumatoid arthritis, and many other diseases can be treated by specialized infusion therapies. Companies are trying to manufacture infusion devices that are lighter, more portable, more rugged, and usable at eye level. Most pumps today are large, heavy, and not designed with transportability in mind. Home infusion is a safe and effective alternative to inpatient care for many disease states and therapies. For many patients, receiving treatment at home is more suitable as it reduces the cost and cuts down frequent visits to the hospital. The dose error reduction software loaded to infusion pumps includes a drug library with predefined lower and upper drug dose limits and infusion rates that decreases the infusion errors. Although, the usage of this technology is comparatively low. Due to the concerns related to needle injuries, the use of needless connectors has seen a commendable growth when compared to the previous years. Some Asian countries have begun using needless connectors as well. Teleflex, Becton Dickinson lead US Central Venous Catheter market associated by antimicrobial technology which is known to reduce the exposure to pathogen during its use. Who are the Major Players in Infusion therapy market? Some of the major players in the home infusion therapy devices market are Hospira, Inc.(U.S.), B. Braun Melsungen AG (Germany), Caesarea Medical Electronics (Israel), Fresenius Kabi AG, Care fusion, Inc.
JMSCo. Ltd., Baxter (U.S.), Terumo Corporation (Japan), Novartis, Roche Diagnostics, Kimberly-Clark Corp.
Underst the different dynamics influencing the market – key driving factors, challenges hidden opportunities. Underst the industry supply chain with a deep-dive on the value augmentation at each step, in order to optimize value bring efficiencies in your processes. Get a quick outlook on the market entropy – M&A’s, deals, partnerships, product launches all key players for the past 4 years. *More than 15 Companies are profiled in this Research Report, Complete List available on Request"*Financials would be provided on a best efforts basis for private companies"